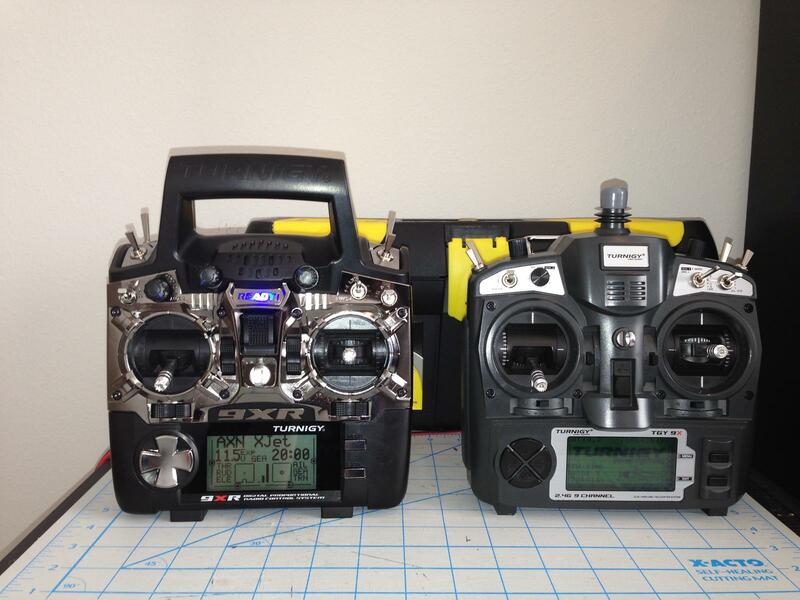 I have been away from rc flight for a bit, and I am looking for a good transmitter/reciever and am looking for advice. Also with the new transmitters like the spektrum are crystals still needed for the recievers? How committed are you in getting back to the hobby? You will most likely want to get a decent radio that will allow programming and stuff- a Spektrum Dx6i would get you started and give you room to grow back into the hobby. You can use Spektrum rx or buy the budget orange receivers, I use them almost exclusively. The Orange Six TX would also be a good starter and more budget friendly. If you think you are going to want more channels and more flexibilty the turningy/fly sky radios are affordable, way configurable, but may be more than what you really want, depends on what you are after. They do have options that make them attractive if you are wanting to do DLG or stuff that requires more channels. You want a GOOD transmitter/receiver. Depending on your specification of GOOD. You normally have to go to at least 8 or 9 channels to get "all modes" for planes helis and gliders - but you can normally do most mixes yourself on a cheaper transmitter. 2,4 - all systems are good. Telemetry is something you will get in all new systems but today you want "speaking telemetry" and they are not common in the budget transmitters. User friendly - Spektrum new systems (not DX6i), Hitec Aurora, Graupner, Futaba and other GOOD transmitters are fine. Taranis have all features but cant be described as user friendly yet as there are lots of firmeware to download and try. I might venture into helicopters, but for the most part I am kind of a slow flyer kind of person. Eventually I am going to look for some aircraft that can get after it...but I really do not see me using more than 6 channels. Thanks for the advice guys. One more quick question. What would be a couple of good websites to look for servos...transmitter...brushless motors and esc...and recievers. Guess I could have just said electronics. I always start my hunt with budget. It doesn't do me any good to know which transmitter is best if I can't afford it. That's the case with some of the newer high end transmitters like the Hitech Aurora. I started with the Turnigy 9x, which has a fairly strong following here. The Turnigy 9x or 9xr start around $50 to $80 depending on the options. If you can afford a bit more, The FrSky Taranis is the current RC sweetheart. Partly because it is a quality radio under $200. And partly because it uses OpenTX an open source firmware, which is always being updated and improved. The downside is that right now they are backordered everywhere. If you want one, you either have to get on a waiting list, or pay a premium to have it shipped from China. The Turnigy 9x and 9xr can both also run OpenTx like the Taranis. The 9x has a more classic look whereas the 9xr has that glitzy cheap Chinese look to it. See picture. Either is a good radio, but if I had to do it over, I may have gone with the 9xr instead of the 9x in spite of it's cheap look, and I would have bought it without a module. Here's why. The 9xr has a built in LCD back-light. The 9x doesn't, but you can buy a back-lit kit for under$. The 9xr has a built-in USBASP programming port. The 9x doesn't, but if you are proficient with soldering, you can add on yourself. The 9xr requires a LiPo battery pack. The 9x comes AA battery ready, but you can also use a LiPo pack. Unfortunately getting the right connector has been an issue, resulting in several of us (including myself) reversing the polarity and frying a couple of components on the radio. The 9xr comes with both JR and Futaba training ports. The 9x has only a JR training port. With either transmitter, I would choose to purchase the model without the FlySky module. Instead, I would choose An FrSky DJT module and receiver which is reported to have a much better range and reliability than either the FlySky or the Orange DSM2 radio systems. And now, the FrSky DXT module is available which would make it compatible with the newest generation of FrSky products. Those are my budget recommendations for under $250. You guys are awesome. Thanks so much for the help. I should be back in the sky in no time at all. If you fly with a group, what radio does most of the guys use? This was one of the biggest reason we went with Spektrum and Dx6i.